The first visit will involve a thorough history of your health concerns, an complete examination including a full postural analysis, a functional assessment as well as x-rays or other special tests if necessary. 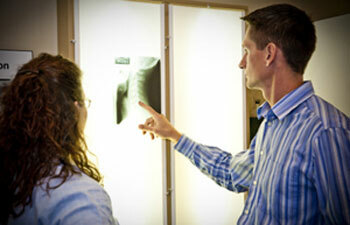 The purpose of your consultation is to help identify the cause of your problem. Your health is your responsibility so it is your choice how far you would like to take your care. We will discuss your health goals and help you determine how you can achieve them. We will need a complete picture of your health in order to provide the best possible treatment for you as an individual. Plan to spend 40-50 minutes for your first visit. If our doctor diagnoses a problem that would be suitable for chiropractic, he will focus on the specific cause of your symptoms, and prepare your care plan which will be discussed with you on your Second Visit. Dr. Zeni explains what he finds. Your doctor will review your examination results with you on your second visit. We call this the Report of Findings as we will discuss the findings of your examination. During this visit we will let you know whether or not your condition is something we can correct, how it may be affecting your health, and most importantly, our best recommendations to improve your health. If your doctor determines that chiropractic care is indicated for your condition, you will begin your adjustments on this visit. Our recommendations are designed to help you achieve your health goals whether it be pain relief, correction, prevention or wellness. We believe we have great success with our patients because all of our patients are thoroughly educated about how chiropractic works! We use a gentle approach to chiropractic care for your comfort. At this point we have laid all the groundwork for you to understand your condition and make an educated decision to proceed with care. Your regular visits will consist of a quick evaluation of the condition of your spine and nervous system by the doctor and a specific, extremely gentle adjustment. The adjustment is designed to improve your posture, remove nerve compression and allow your body to function and heal better. It only takes a few minutes to be adjusted, however the benefits are extremely long lasting! From there you are ready to enjoy your day with a stronger, healthier spine and nervous system. Contact us for your free consultation.